Maverick provides, engineering and construction services for all types of small cells and oDAS installations. Maverick has engineered and installed over 6000 small cell DAS node installation in both the Power Space and the Communication space throughout the United States. Mavericks construction crews are qualified in both the Electrical and communications space. 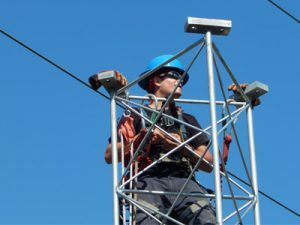 They have a depth of knowledge and training that allows them to work safely on and around utility poles in the right-of- way, and to property install, test and commission wireless equipment. Maverick has over 150,000 square feet where we assemble Street Light nodes and prepare for installation. Areas where Maverick has installed small cell nodes.